Used for activities by and announcements from VolCom. providing training and volunteer service resources to the rest of the organization. recruiting and managing incoming volunteers, handling exiting volunteers, handling all committee set ups as well as chair and staff turnover. setting up tools for committees, subcommittees and workgroups, assisting with internship processes, mentoring volunteers in their work, and tracking the service of each and every volunteer throughout their time with the organization. ensuring that every volunteer in the organization has the resources they need to complete their work efficiently and effectively. If you have ever read fanfiction on AO3, gone searching for an obscure fact on Fanlore, or created a fanwork without being sued or served with a cease and desist letter, all of that was made possible by Volunteers & Recruiting. The OTW and its projects absolutely would not continue to function without their committee, so on behalf of everyone at the OTW, thank you to all their staff, past and present! Every month or so the OTW will be doing a Q&A with one of its volunteers about their experiences in the organization. The posts express each volunteer’s personal views and do not necessarily reflect the views of the OTW or constitute OTW policy. Today’s post is with Megan Diane, who volunteers as a staffer in our Volunteers & Recruiting Committee. 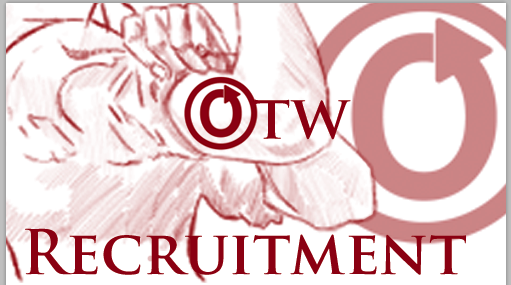 I am a volunteer for the OTW Volunteers & Recruiting Committee. The OTW is completely volunteer run, and those volunteers need training, access to tools, and support. I like to think of Volunteers & Recruiting as one of the backbone committees of the OTW; we help provide infrastructure for current volunteers, onboard new volunteers, and thank any volunteers who leave us.